One teenager’s attempt to wow online viewers with a daring jump from London’s iconic Tower Bridge ended in disaster when he had to be fished out of the River Thames by a lifeboat crew and admitted to hospital with severe exhaustion. 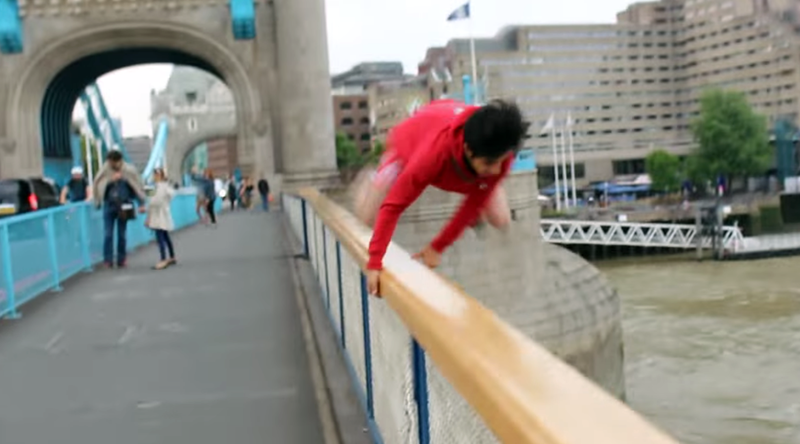 Performing arts student and video blogger Shah Faisal Shinwari, 17, posted a heart-stopping video in which he hurls himself off Tower Bridge in central London, but rather than make it safely out of the river, the teenager can be seen getting swept downstream by the strong current. In the video, an exhausted Shinwari is seen shouting “help” before finally dragging himself to the side, where lifeboat workers help him ashore and pump water out of his lungs. RNLI community safety manager Tony Wafer said: “As a lifesaving organization that works on the Thames, we are extremely disappointed this young man chose to risk his life in this way. “He was extremely lucky the outcome wasn’t more serious. “We’re glad this young man regrets his actions, but we would strongly discourage anyone from doing anything like this. Jumping into the Thames from a bridge is extremely dangerous. “The shock of cold water can make it very difficult to swim and strong currents can rapidly sweep people away,” he added. The video, uploaded to YouTube on July 22, has received thousands of views, but the stuntman has since realized it was the “stupidest” idea he’s ever had. “When I dropped into the water, I couldn't breathe,” Shinwari said. “It was the stupidest idea in the world. He was treated in hospital for exhaustion and an infection he contracted by swallowing dirty river water, and then returned home where he has been recovering. “My belly hurt so much,” he said. “I had so much water in my lungs, and I swallowed so much. I think it was the dumbest idea I’ve ever had. “I thought it would be fun, but so much stuff went wrong. “I got lucky that I survived. It's not worth risking your life for a stupid dare. It was really dangerous.